In the last 4-5 years, India has shown tremendous growth and development in the technology sector, which has also made a much needed positive impact on the economy of the country. With several major decisions taken by the government of the country that include Digital India Campaign, demonetization, GST regime, and much more. According to Ravi Shankar Prasad, minister of electronics and information technology of India, the country is looking to surpass a digital economy of $1.115 trillion by the year 2024-25. In his statement, he said India has developed a great deal under the rule of Narendra Singh Modi and many giant foreign companies are looking to make a huge investment in the country. With the introduction of Digital India Campaign, Prasad said that the internet users in India have increased massively in the last two years due to the emergence of low priced smartphones and affordable 4G internet services provided by telecom companies. The number of people visiting the internet has also promoted digital payments where people are now paying for the products and services online instead of the real money. Due to the demonetization last year, the flow of real cash has reduced greatly whereas digital payments have increased by over 300%, which has also paved the way to e-business, bank accounts, better payment facilities, etc. Furthermore, with Aadhar cards and UIDAI, every citizen is getting a digital ID where all of his transactions can be recorded along with offering them quick and easy banking, telecom and other digital services. Not only this, with GST implementation, the taxation system of the country is also witnessing a revolutionary change where all the indirect taxes on the products and services are combined to one tax, allowing the businesses and customers an easy transaction. Many MNC companies such as IBM, Google, Microsoft, Tech Mahindra, NIIT, Lava International, Wipro, etc. have understood how far this digital economy would go in the country and expected it to cross the $1.115 trillion mark by 2025. Alongside this, many other digital projects are being launched by the government, such as Skill India, Make in India, StartUp India, 50 Metro Projects, 100 Smart Cities and Swachh Bharat Abhiyan, are also supporting this trend to achieve the feet. It is also expected that by the year 2024-25, over 30 million jobs will be introduced in accounting, taxation, technical, electronics and other sectors. It will also increase small jobs by a greater margin as companies would require professional candidates to perform their business functions. The top three contributors of the new jobs will be electronic, telecom and information technology with a contribution of 8.9 million, 8.8 million and 6.5 million respectively. eCommerce and cybersecurity would also offer a significant part with 6.9 million and 2.5 million. Surely with increased digital payment, security needs to be enhanced to prevent the activities of fraudulence and cyber threat. If all this is true, then we will be looking at a magnificent growth in the digital sector of the country where wide opportunities for aspiring candidates can be witnessed. Students who are pursuing college and looking to make a career in the digital industry must take a step now so that they can grab the outstanding opportunity that is coming their way. The best thing to do would be joining a high-quality digital marketing course in Delhi where they can learn valuable skills and expertise that would be required by giant industries in their business processes. With everything from sale and purchase of goods and services to payment is happening online, digital marketing course would help the candidate make sure the processes are performed smoothly. By gaining knowledge on website development, internet advertising, Google analytics, and Adwords, email and SMS marketing, eCommerce marketing, PPC, SEO and SMO, the demand for digital marketers is going to see a massive jump in a couple of years with the ongoing work of the government. Furthermore, enhancing digital marketing skills would also help candidates to secure a better job profile and position in the company with a higher salary than any other department. If you are thinking of pursuing a course in digital marketing, then join an effective digital marketing course from a reputed training firm and solidify your path for a successful career. 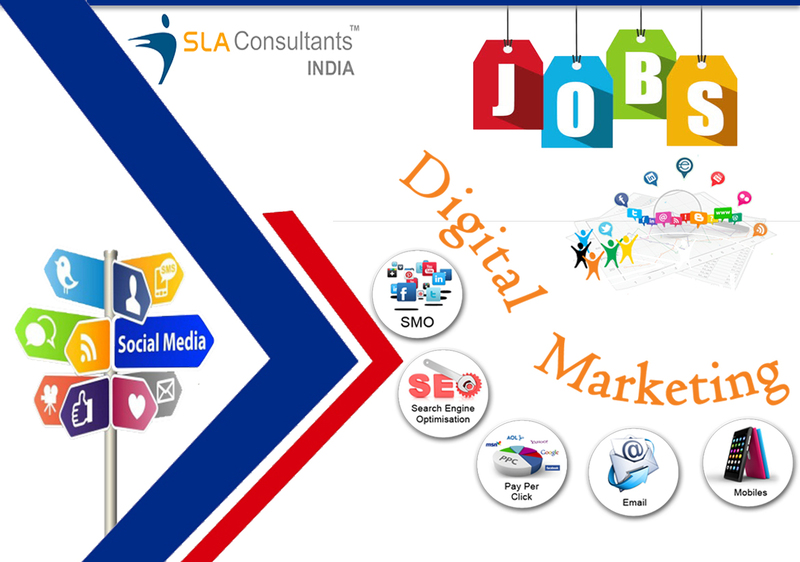 SLA Consultants India is known to offer the best Digital Marketing training course to aspiring candidates in Delhi NCR with latest course material, including in-depth knowledge on GST, digital marketing elements, and more job oriented and industry focused training method.